Emmeline is a cubicle sprite - she inhabits offices along with her numerous relatives, living off what people leave behind at the end of the day. Biscuits, coffee - the staple diet of the office worker. Her clothes are fashioned from bits found around the office. Her family, and all the other sprites, live secretive, hidden lives, never allowing the day time inhabitants of the cubicles to catch a glimpse of them. But Emmeline is different. 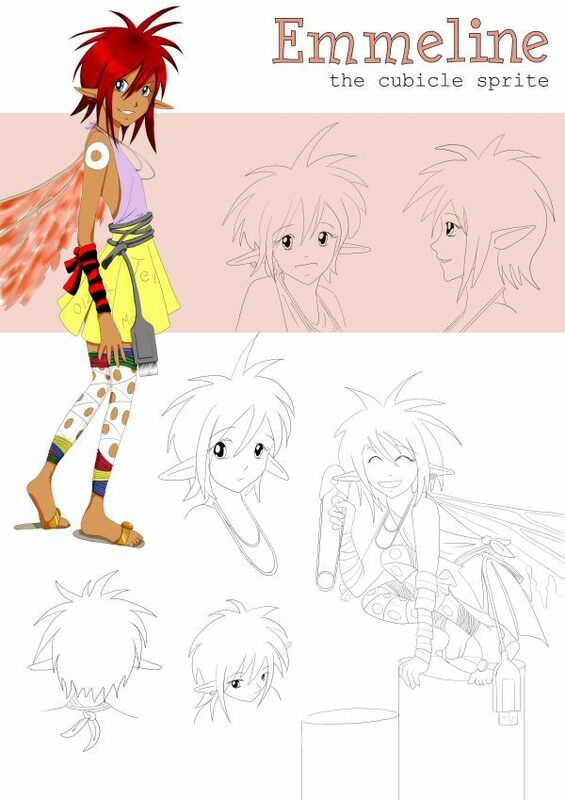 This was drawn as a character design for IMAF 2006. The brief was "Design a mythological character for the present day. The character needs to be put into a modern context and a modern day situation - the situation must not be complex, but more every day – even mundane." I was honoured to be awarded the first prize for Emmeline.